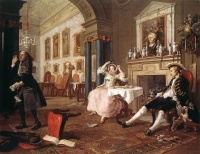 The Tête à Tête is the second canvas in the series of six satirical paintings known as Marriage à-la-mode painted by William Hogarth. The actors in this classical interior are the son of an impoverished earl, a rich merchant’s daughter and their butler. London's National Gallery, founded in 1824, houses a rich collection of over 2,300 paintings dating from the mid-13th century to 1900 in its home on Trafalgar Square. The collection belongs to the British public and entry to the main collection is free, although there are charges for entry to special exhibitions. The National Gallery's beginnings were modest; unlike comparable galleries such as the Louvre in Paris or the Museo del Prado in Madrid, it was not formed by nationalising an existing royal or princely art collection. It came into being when the British government bought 36 paintings from the banker John Julius Angerstein in 1824. After that initial purchase the Gallery has been shaped mainly by its early directors, notably Sir Charles Lock Eastlake, and by private donations, which comprise two thirds of the collection. The resulting collection is small compared with the national galleries of continental Europe, but has a high concentration of important works across a broad art-historical scope, from the Early Renaissance to Post-impressionism, with relatively few weak areas. The present building, on the northern side of Trafalgar Square, is the third to house the Gallery, and like its predecessors it has often been deemed inadequate. The façade by William Wilkins is the only part of his original building of 1832–8 that remains essentially unchanged, as the structure as a whole has been altered and expanded in a piecemeal manner throughout its history. Notable additions have been made by E. M. Barry and Robert Venturi. The current Director of the National Gallery is Nicholas Penny. Unless indicated otherwise, the text in this article is either based on Wikipedia article "National Gallery" or another language Wikipedia page thereof used under the terms of the GNU Free Documentation License; or on original research by Jahsonic and friends. See Art and Popular Culture's copyright notice. This page was last modified 20:59, 18 March 2018. This page has been accessed 7,311 times.